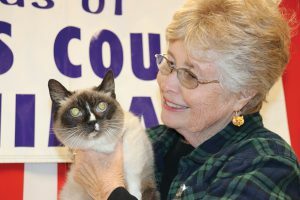 FOCCAS volunteer Sheila Ward loves cats, but she and others are working to limit Coos County’s feline population. You can run out of gas. You can run out of money, time or patience. Nobody ever seems to run out of cats. Specifically, it’s a math problem. Cats aren’t far behind rabbits in the multiplication department. A female cat may get pregnant when she’s just 4 months old, and she can deliver as many as three litters a year. So FOCCAS fights a perpetual campaign to reduce uncontrolled cat breeding. One of its allies is the Coquille Tribal Community, which this year gave the group a $5,000 grant to help cover vet fees. FOCCAS was founded in 2006 to promote animal welfare and ease the strain on the county shelter. Its 35 volunteer foster homes have cared for thousands of animals awaiting adoption. Cats in the group’s care consistently outnumber dogs, but the felines’ rapid reproduction is only one reason. Owner attitudes are another. “They just don’t think of spaying and neutering their cats as much as they do with dogs,” Ward said. When kittens arrive, people commonly advertise them on Facebook, give them away outside Walmart, or dump them along some rural road. Sometimes people move out of an apartment, leaving behind a cat and half a dozen kittens. Tribal fund Administrator Jackie Chambers said she’s glad for the chance to help. The Coquille Tribe’s grant will help cat owners who can’t afford the cost of spaying (for female cats) or neutering (for males). FOCCAS provides vouchers for the S/Nipped clinic in Empire. Along with financial help, FOCCAS aims to change cat owners’ attitudes. Ward said some people who receive vouchers neglect to use them. She recalled a woman who forgot to fix her tomcat, only to face a big vet bill after a feline rendezvous led to a bloody fight. The Coquille Tribe’s $5,000 grant to FOCCAS was one of two environment-oriented grants the tribe will award during its 2019 Grant Week. The Coos Watershed Association received $2,000 for a project involving environmental murals and native plant species. Overall, the tribal fund’s Grant Week awards totaled $261,762 to 49 grantee agencies. Since being founded in 2001, the fund has awarded more than $6.4 million to community organizations serving five counties. FOCCAS needs donations, volunteers and additional foster homes for dogs and cats. Adoptable pets are on display each Saturday at Pony Village Mall. Learn more at http://www.friendsofcooscountyanimals.org, or call (541) 269-1989.